Laal maans (Hindi: लाल मांस; lit. 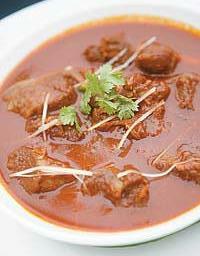 "red mutton") is a meat curry from Rajasthan, India. It is a mutton curry prepared in a sauce of yoghurt and hot spices such as red Mathania chillies. This dish typically is very hot and rich in garlic, the gravy may be thick or liquid and is eaten with chapatis made out of wheat (usually eaten in summers) or bajra (a millet grown in Rajasthan and eaten in the winter months). Chef Bulai Swain said that: "Traditionally, laal maas was made with wild game meat, such as boar or deer and chillies were used to veil the gamy odour of the meat. It was a favourite among the royalties. While the spicy flavour is remained intact now, the meat used is tender mutton." ^ a b "Jungli Laal Maas". sanjeevkapoor.com. Archived from the original on 4 January 2011. ^ Petrina Verma Sarkar. "Red Meat Curry (Laal Maas) Recipe". About.com Food. ^ "Relish Rajasthani delights". The Hindu. 27 February 2015. Retrieved 29 June 2015. This page was last edited on 18 December 2018, at 04:08 (UTC).